Monogrammed Weekend Travel Bags. Get your vacation or weekend travels off to a stylish start with this classy and fashionable Boho medallion pattern multi color duffle bag. Generous size with supported bottom, two side zipper gusset pockets. Web fabric handles with detachable shoulder strap. U-shaped top zipper closure for easy access. Matching lunch tote available search item SWT-8010STAR. 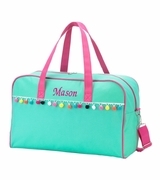 Personalization with monogram or name is always an option from Simply Bags. 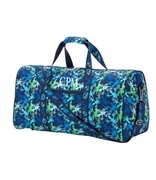 Monogrammed weekend travel bag measures 20"W x 11"H x 10" across bottom. Micro fiber fabric and unlined. 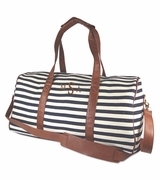 Love this weekender. Far exceeded my expectations and the recipient loved it. I will buy from this company again. Very quick turnaround. Couldn't be more pleased.